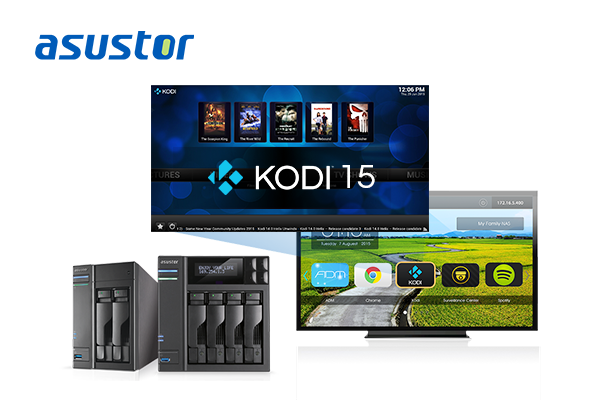 Taipei, Taiwan, September 8th , 2015 – ASUSTOR Inc., a leading innovator and provider of network storage solutions, has announced that it is the first in the industry to support the newest version of Kodi, Kodi 15. ASUSTOR 50, 51, 61, 62, and 7 series NAS users will be able to upgrade to this newest version to enjoy even more powerful and convenient multimedia applications. In an effort to enhance multimedia applications on NAS devices, ASUSTOR has designed NAS models with HDMI ports. Users can use the Kodi add-on App to instantly turn the NAS into a multimedia player, playing multimedia files directly from the NAS. In order to further strengthen the Kodi multimedia playback experience, ASUSTOR will also soon release AiCast, a powerful dedicated remote mobile app for Kodi. With AiCast users will be able to conveniently select media and control playback on Kodi from their local network or even remotely. Please stay tuned for more information! Log into ADM and download or upgrade Kodi from App Central.